Canyon View: Larissa Dabb, Shelbi Nicoll, Aspen Bergener, Jessica Pace, Ashlyn Banks, Merrica Stubbs. Cedar: Jasie York, Mic Webster, Merce Tarrayo, Harley Taylor, Kaysie Klemic, Sara Kovac, Alexia Bird, Brinley Hess, Regan Haslem, Madison Fagg. Desert Hills: Kennedy Peck, Samantha Crane, Rachel Myers, Chloe Taylor, Samantha Nelson, Abby Monson, Hannah Stuart, Trinity Schimbeck, Bailey Brinkerhoff, Lacey Swaney, Makenzie Woolley, Emma Jacobsen, Lauren Luekenga, Lily Poulton, Morgan Kennedy. Dixie: Halle Anderson, Emilee Nelson, Kacee Griffen, Emme Leavitt, Gwen Sepp. Hurricane: Mafue Leele, Alexis Martin, Sariya Sims, Lexi Hatch, Mylee Moon, Kira Wilson, Saige Anderson, Mckena Carter, Brooke Thomas, Kevianne Carter. Pine View: Alli Baker, Regina Wright, Jessica Hill, Brynlee Wade, Jada Chepkwurui, Rylee Holt. Snow Canyon: Sophie Chandler, Hallie Remund, Kayla Loris, Rachel Durante, Samantha Johnson, Kenya Rowley. Team Preview: The Desert Hills Girls were the ones to win the Region Title last year but it was Cedar who held the State Championship trophy at the end of the season. Going into this season both squads look to take the Region and State Titles. Desert Hills being led by Kennedy Peck and Samantha Crane while Cedar being led by Jasie York and Mic Webster. Individual Preview: Jasie York will be the highlight from the girls side. She was the State Champ in the 200m and 400m last year and she comes into this season being the top returner in those two events while having the 3rd fastest returning time for the 800m. 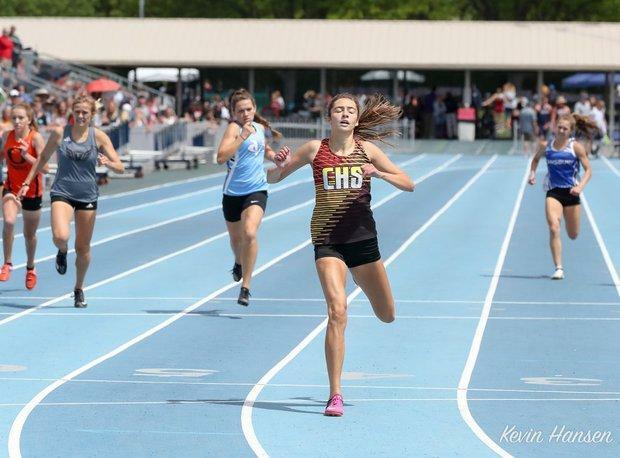 Ali Baker of Pine View is the top returner in the 800m, Mic Webster of Cedar is the top returner in the 1600m, Merce Tarrayo of Cedar is the top returner in the Shot Put, and Sophie Chandler of Snow Canyon has the top returning mark in the Javelin. Returning State Champs Chloe Taylor of Desert Hills will look to defend her title in the 300m Hurdles and Alexis Martine of Hurricane defending her title in the High Jump.